Are you interested in a new family friendly science project to help celebrate the Easter holiday this year? 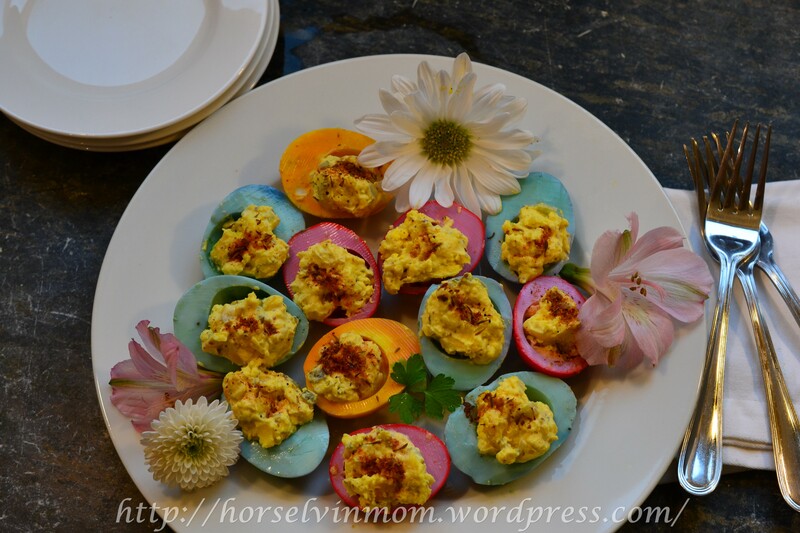 We are mad about earth friendly projects that cater to kids of all ages around here and Angel eggs are a great way to teach your kids how to make all natural food coloring. Plus, this dish is so pretty, it always takes center stage at the Easter dinner table. In addition to being fun for kids, its a healthier option for the littles and its good for the earth. Plus, the ingredients can be found right in your local grocery store, so its an easy project for busy moms. 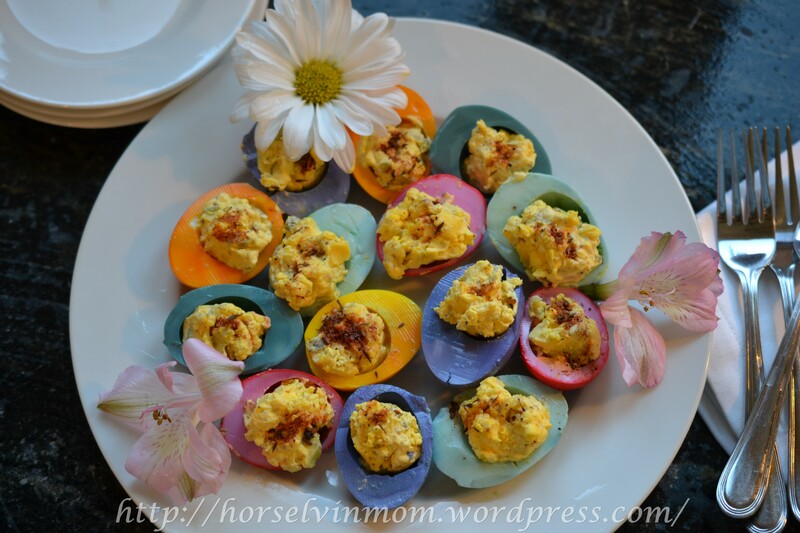 Formerly known as deviled eggs (we’ve changed the name for obvious reasons), angel egg filling and dyes can be prepared a few days before your Easter dinner (just add 2 tbsp. of vinegar to each dye to make them last longer in the refrigerator). Create red dye by boiling beets for 10 minutes. Place beet water in ball jar and add 2 tsp of white vinegar. Orange/Yellow is made by boiling 1 tsp. turmeric in 2 cups water for 30 seconds. Let cool and add egg halves. The eggs will dye quickly. Note: If you would like a deeper shade, add 1/2 tsp. 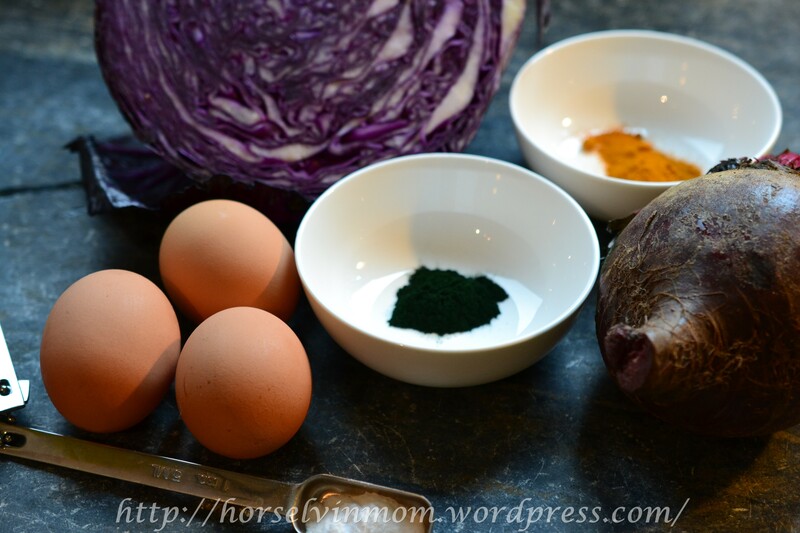 more turmeric and keep eggs in dye longer until you achieve the desired shade. Green dye is made by boiling spinach for 1 minute and letting it simmer for 10 minutes. Place green dye mixture in ball jar with 2 tsp. white vinegar. Place egg halves in jar into refrigerator for at least 24 hours. Note: The spinach green is a much earthier green than the dye you will find in the store. Green dye can also be achieved by adding 1 tsp. of Spirulina powder to a quart of boiled water. Stir in powder and let cool. Spirulina creates bright green eggs. Purple dye is from boiling purple cabbage. Wash the cabbage, cut out stem and cut into large pieces. Place in pot and cover with water. Boil for 10 minutes. Blue: Pour half the cabbage water into a bowl with ½ tsp of baking soda at a time until you get the desired blue hue. Secret to making eggs peel so easily, your toddler can help you: place a teaspoon of salt and eggs into pot of water. Turn on high until rolling boil. Boil for 10 minutes. Immediately pour out hot water and replace with ice cold water. Place halved hard boiled eggs with yolks removed into each color (we use Ball jars with lids). Place in refrigerator overnight for the brightest hues. Easter is a favorite time of year here in the northeast. The warm sun melts away the last moments of the cold winter days and daylight lingers just a little longer each evening. But what we love most about this time of year is honoring our Lord and Savior. As you are dropping the eggs into the food coloring, be sure to share the story of God’s precious gift with your littles. It’s the most wonderful time of the year!